Samosa can find anywhere in India and you can also make it in home too. 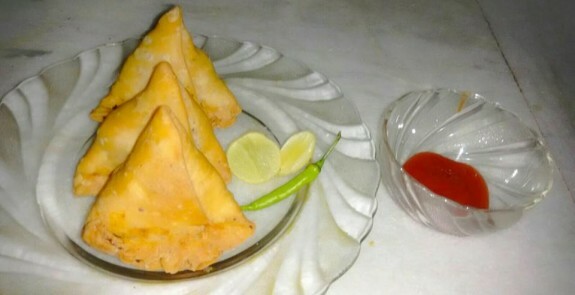 However, you can get the readymade patty sheets of samosa but here I am going to show you everything about the Samosa recipe. In bengali it is called as “Singara”. 1. Combine all the ingredients in a bowl and pour little water into it. 2. Knead into it to make hard dough. 3. Cover the dough with a wet muslin cloth and keep it aside for 10 – 15 mins. 2. When the cumin seeds crackle, add asafoetida and ginger green chili paste. Saute it for few seconds. 3. Add the potatoes and green peas and mix well. Cook them on medium flame for 3-4 minutes and also mash them on the back of your spoon. 4. Add dry mango powder, garam masala powder, coriander powder and salt. Mix them very well and cook for another 2-3 minutes. Stir continuously while cooking. 5. Add coriander leaves and mix well and cook for another 1 minute. 6. Remove from heat and divide the stuff into equal portions and keep it aside. 1. Knead the dough well till smooth and elastic and divide it in equal portions. 2. Roll out a portion of dough into a round or oval in shaped like roti. 3. Cut the oval into 2 equal portions horizontally using knife. 4. Take one portion of the cutting and joined the edges to make a cone. 5. Stuff the cone with some portion of stuffing and apply little water on the edges so that it could seal easily. 6. Press the edges and seal it and give one mold on the sealed edges to give proper shape of Samosa. 7. Repeat the same with the remaining dough. 8. Heat oil in a pan/Kadhai and deep fry all the samosas in a medium flame until they golden brown in colour from both sides. 9. Drain the excess oil and serve hot with your favourite chutey.